Growing paddy is not viable for small farmers of Kerala. Will the state be able to preserve the crop which delivers a number of ecological services and provides Kerala its staple food? FORTY-five-year-old P K Praveen, resident of Kannambra village in Kerala’s Palakkad district, belongs to a family that has grown rice for generations. Ten years ago, he converted all eight hectares (ha) of his rice fields into rubber plantation. “Rubber is very profitable,” he says. Its market price is Rs.160 per kg. A few months ago, it shot up to Rs.240 per kg. The state government procures paddy at Rs.18 a kg, one-and-a-half times the minimum support price (MSP) fixed by the Centre. Praveen’s calculation is simple. He gets 2,000 kg latex from one ha per year. At the current market rate, his profit is more than Rs.1.5 lakh per year. He spends Rs.1.5 lakh per ha to grow rubber. This includes Rs.1.50 per tree wage that he gives to a couple he has employed for tapping latex, done 10 months a year. Compared to this, paddy fields bring profits of only Rs.60,000 to Rs.70,000 per ha for two seasons. What’s more, the Rubber Board gives the grower production bonus of Rs.1.95 lakh per ha a year till the plants mature, which can take six to seven years. During this time, for three years, he can grow fruits or vegetables as intercrops. High profit is not the only reason Praveen shifted to rubber cultivation. “There are not enough farm hands and their wages are increasing by the day,” he says. Paddy is a short-term crop and timely availability of labourers for preparing fields, transplanting, weeding and harvesting is crucial. Palakkad, the rice granary of Kerala, has about 83,000 ha under paddy cultivation, accounting for 40 per cent of the state’s total paddy area. The district, along with Kuttanad region in Alappuzha and the coastal areas of Thrissur district, is the main rice producing region. Palakkad has 12 dams constructed exclusively for irrigating paddy fields. The average yield in the district is 4-5 tonnes per ha, higher than the state average of 2.7 tonnes. But rice in Palakkad faces stiff competition from crops like banana, ginger, rubber, coconut and mango. Praveen is lucky that he has a large farmland. For small and marginal farmers, growing rice, the state’s staple food, is unviable, says Muthalam thode Mani, general secretary of National Farmers’ Union. Most farmers in Palakkad have been in distress due to increasing cultivation cost of paddy and low profits. “Since 1995, more than 350 farmers in Palakkad have committed suicide. Most were rice growers,” he says. The state has about 300,000 rice growers, mostly small and marginal farmers with their average land holding below 0.4 ha—one-fifth the national average. Cultivable land in Kerala got fragmented into small holdings when the state government implemented land reforms Act between 1967 and 1982 to distribute agricultural land to the landless. The Act fixed a limit of 6 ha on farms. Plantations were exempted from this cap. 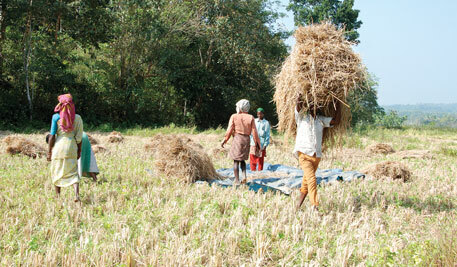 Since 1970s, the state has witnessed a steady decline in the area under paddy. In the last four decades, rice fields have reduced by 76 per cent from 875,000 ha in 1970 to 208,000 ha in 2012 (see graphs on p21). A crop’s profitability depends on land size, production cost, harvesting cost, yield and marketing efficiency. “As for rice in Kerala, land size is small, cost of production high, yield moderate and market price has not increased in proportion to the escalating production cost,” says K G Padmakumar, former associate director of Kumarakombased rice research station under the Kerala Agriculture University. He was part of a five-member state committee that examined the problems of the rice sector in 1997. The committee found that at Rs.522, the cost of producing one quintal of rice (1 quintal equals 100 kg) was the highest in Kerala. It was Rs.258 in Andhra Pradesh, Rs.281 in West Bengal and Rs.183 in Punjab. The national average was Rs.268. The prime reason for the high production cost in Kerala was steep rise in farm wages, says Padmakumar. Wages have increased much faster in Kerala than in any other state. In Palakkad, farm wage is Rs.200 for women and Rs.400 for men per day, less than the wages in most of Kerala, where women get Rs.400 and men Rs 600 per day. Construction boom, along with expansion in the education sector, triggered labour crisis, as many of them shifted to the more profitable sectors. A thriving real estate industry was also a contributing factor. Kerala is land-starved. With an area of 3.8 million ha, about one per cent of India’s total, the state is home to 33 million people, three per cent of the country’s population. Land has high value. Even in rural areas, land costs more than Rs.100,000 a cent (one cent equals 0.004 ha). But what made labour shortage acute was the Centre’s Mahatma Gandhi National Rural Employment Guarantee Act (MGNREGA), introduced in 2006, say farmers. “Labourers, mostly above 50 years of age, prefer to work under MGNREGA programmes despite lower wages as the work is less labour intensive. Working in paddy fields is much harder,” says Thankachan Varghese, rice farmer in Kuttanad. Majority of the people under 35 years are educated and seek salaried jobs, he adds. This apart, the state converged MGNREGA with crops such as coconut, not with paddy. According to National Sample Survey, between 1993-94 and 2004-05, the number of farm hands in Kerala declined by 879,000, though the total number of workers increased by 1,605,000. In 2004-05, only 35.5 per cent of Kerala’s workers were engaged in agriculture while the national average was 56.5 per cent. Farmers who grow cash crops such as rubber get necessary advices, good plants and production bonus from the Rubber Board. But in the case of paddy, farmers do not get institutional support. They get a subsidy of Rs.4,000 per ha under the Centre’s Rashtriya Krishi Vikas Yojana and the state’s Sustainable Development of Agriculture programme. But this is inadequate considering the per-ha cultivation cost of Rs.60,000, says S Arun, organic rice farmer in Muthalamada panchayat in Palakkad. “Besides, farmers with land holding more than 2 ha do not get the subsidy,” he says. “The most distressing factor is that government delays payment for the rice it procures,” says K B Suresh who grows rice in 2 ha. “Two to three months’ delay is usual,” he adds. Padmakumar, member of the committee that examined the rice sector, says growing paddy will be viable only if the state government procured it at double the MSP announced by the Centre. MSP did not rise in proportion to the rise in cultivation cost, says social activist and priest Thomas Peeliyanickal in Kuttanad. The state’s procurement price has increased from Rs 7 per kg about 10 years ago to only Rs18 per kg today. To overcome the labour crisis, farmers are now slowly shifting to mechanisation. Harvesting has been mechanised in almost all the regions of the state. “This would have happened much earlier had labour trade unions not resisted it,” says Sadanandan P, rice farmer in Kuttanad. Local bodies purchase machines which farmers take on rent. The machines are expensive. One combine harvester, a machine that can perform three faming activities, costs Rs.20 lakh. So the number of machines a local body can purchase is grossly inadequate to meet the needs of all farmers. Some farmers hire machines at high rates from private agencies in Tamil Nadu and Karnataka. While the rent for a government machine is Rs.1,300, it is between Rs.1,600 and Rs.1,800 for a private machine. The cost crosses Rs 2,000 during the peak season. In Kuttanad, the state government bought 150 combine harvesters under the Kuttanad Package, a Rs.1,840-crore Central scheme launched in 2008 on the recommendations of agriculture scientist M S Swaminathan to revive the ailing paddy sector. But the region needs at least 350 machines. Timely availability of adequate number of machines and efficient operation will help a lot, say farmers. Given the problems, farmers say they are left with few options—leave the land fallow, switch to more profitable crops, or rent out the land. 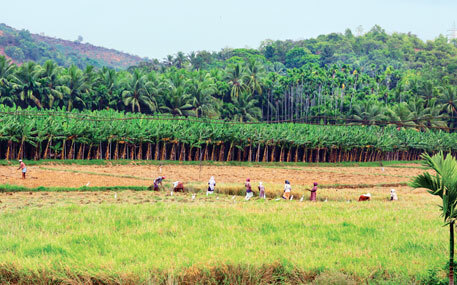 “Many from outside Palakkad take the rice fields on lease to grow banana and ginger. For ginger, the annual per-ha rent is Rs.75,000, and for banana, it is Rs.35,000,” says Arun. Profit for banana from one hectare a year is Rs.1.5 lakh and that for ginger is Rs.3 lakh. In Muthalamada, except for a few farmers like Arun, all have switched to coconut and mango. The steady loss of paddy fields will have a serious impact on the state’s economic and ecological sustainability, and food and water security, says V S Vijayan, former chairperson of the state biodiversity board. In the name of infrastructure development, the state government itself reclaimed paddy fields and wetlands. Between 2004 and 2011, the state lost 160,000 ha of wetlands, he says. Palakkad reflects the general trend in Kerala’s rice sector. Except for Kuttanad region, spread in 50,000 ha in Alappuzha, Kottayam and Pathanamthitta districts, and Thrissur district, the rice fields are disappearing fast. Kuttanad has a unique ecosystem where farming is done below sea level. The Food and Agricultural Organization of United Nations recognised the region as Globally Important Agricultural Heritage Site in 2013. Its soil is very fertile and rice yield is 7-8 tonnes per ha. The trend continues despite the state enacting the Kerala Paddy Land and Wetland Conservation Act in 2008. The Act prohibits conversion and reclamation of paddy land and wetlands. It prohibits leaving rice fields fallow or using them for any other purpose without the permission of a district-level or a state-level monitoring committee. “The law was enacted to save paddy fields and wetlands,” says Mullakkara Ratnakaran, state agriculture minister in the previous government. But the Act has loopholes. It allows government to reclaim land for public purposes. It also allows reclamation of 10 cents of paddy fields in panchayat areas and 5 cents in town areas for building houses. 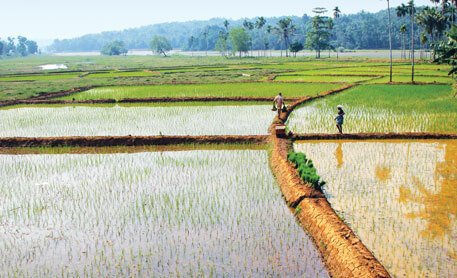 The State Agriculture Statistics 2012 reveals that after 2008, Kerala lost more than 25,000 ha rice fields. Paddy, which was the first choice among the crops in 1970s, has been pushed to the third position after coconut and rubber. 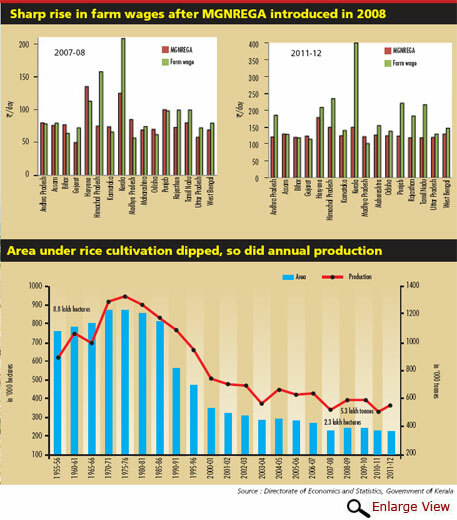 Rice production has fallen from 1,365,000 tonnes in 1970 to 569,000 tonnes in 2011-12. The complex problems of Kerala’s paddy sector have made many, including Planning Commission deputy chairperson Montek Singh Ahluwalia, wonder why the state’s small farmers should grow rice, which barely brings them profits. Addressing the plenary session of Emerging Kerala, a global investors’ meet in Kochi in September 2012, Ahluwalia said Kerala should move on from its insistence on traditional paddy cultivation and use the farms for creating information technology hubs and tourist resorts. The state’s foodgrain needs could be met by production of rice in other states, he said. “Such a comment can send wrong signals to the paddy farmers,” counters Usha S, national convener of Save Our Rice campaign, a network of groups working for sustainable organic paddy farming. Swaminathan, who headed the National Commission for Farmers and formulated a package for reviving the rice sector in Kuttanad, says, “The country needs over 100 million tonnes of rice to meet the demand by 2030. Therefore, all traditional rice farming systems should be conserved for rice cultivation.” Paddy fields are crucial for preserving rich flora and fauna, says S Leena Kumari, head of Rice Research Station, Monko - mpu in Kuttanad. According to a United Nations estimate, the annual monitory value of services offered by inland wetlands is Rs.22 lakh per hectare. For coastal wetlands, it is Rs.107 lakh per hectare. Based on this figure, Vijayan estimated in 2011 that Kerala was getting annual ecosystem services worth Rs.1.23 lakh crore from wetlands. “Conservation of the remaining paddy fields and wetlands is crucial for the state’s ecological and economic sustainability,” he says. Paddy cultivation in Kerala has some unique features. The state’s different regions grow paddy in different ways. While the crop is cultivated two to three metres above the sea level in Kuttanad, it is grown above 1,400 metres in Wayanad district on the Western Ghats. In the coastal regions of central Kerala, Pokkali, a special salt-tolerant rice variety, is alternated with prawn in saline water. “Nowhere else in the world perhaps rice is grown in such diversified ecological and climatic conditions,” says Leena. The state also has some medicinal and highly nutritional rice varieties. “Paddy fields are not production centres of foodgrain,” says Usha. “They are a unique wetland ecosystem that delivers a series of ecological services such as retaining water, helping seepage and recharging groundwater and providing natural drainage paths for flood waters,” she says. If the average water level in a paddy field is one foot, one hectare will hold 3 mil-lion litres of water. This percolates down and replenishes groundwater. Losing paddy fields and wetlands will threaten the state’s water security, she says. Kerala has always been a food-deficit state. Production of state’s staple food is another key factor that calls for continuing paddy cultivation. The gap between the state’s demand and production has increased from 50 per cent in 1960s to more than 85 per cent today. Kerala needs 4 million tonnes of rice a year compared to 0.56 million tonnes it produces. “The state is not food insecure since it gets subsidised rice grains from the Centre and buys the rest from other states. But, Kerala must have a critical minimum grain production in the wake of possible natural calamities and blockage of free grain flow from other states,” says K P Kannan, food security expert with Thiruvananthapuram-based Centre for Development Studies. Many farmers and agriculture labourers still depend on paddy for a living. Besides traditional farmers, many new small groups and individuals have started taking land on lease to grow paddy. After passing the Act for conservation of wetlands and paddy fields in 2008, the then Left Democratic Front government, with help from non-profits and local bodies, initiated a campaign to conserve wetlands and paddy fields. Paddy cultivation was encouraged in fields lying fallow for years. The state government announced an incentive of Rs 25,000 per ha for this. More than 30,000 ha was brought under rice cultivation, mainly by women’s self-help groups under Kudumbasree, a state government poverty alleviation initiative, by taking land on lease. But the efforts were nullified due to reclamation. Many of these groups continue growing rice. In regions like Kuttanad, many small joint liability groups and individuals have come forward to grow paddy (see ‘They show the way’). If Kerala stops paddy cultivation, many small farmers and agriculture labourers will lose their livelihood. Sustainable rice farming will be possible only if its economics is favourable to farmers, says Swaminathan. To make paddy more profitable, the state government should focus on the crop and provide institutional support to farmers with appropriate policies and legislation, he adds. The government must ensure timely availability of quality seeds, mechanisation, better storage, effective procurement and timely payment. Irrigation facilities, especially small and decentralised, need to be improved because 85 per cent of agriculture is rain-dependent. In Kerala, the average land holding of paddy farmers is small. “To enhance their income, farmers can adopt integrated farming by growing rice, fish, vegetables and other crops simultaneously,” suggests R Sridhar of Thanal, a non-profit working for sustainable organic agriculture. Such farming has been successful in the Sundarbans region of West Bengal, he says. Padmakumar says paddy farmers should be allowed reversible conversions of land in which the structure of soil does not change. For instance, in regions like Kuttanad, they can cultivate fish after one crop of paddy, making growing rice mandatory to get a licence for cultivating fish. Rice farmers are eligible for ecological incentives because they serve society by retaining the fields and crop, says K Krishnan Kutty, farmer and chairperson of the state government committee that prepared the Draft Agriculture Development Policy 2013. The government should minimally tax all those who do not grow rice but enjoy the benefits at the rice growers’ expense, he says. About four million tonnes of rice is sold every year in the open market in the state. Tax of just one rupee per kg of rice will fetch the state Rs 4,000 million. This can be used for the welfare of paddy farmers and agriculture labourers. Besides, for every value-added product from rice, farmers need to get avakasalabham, a right on the profit, he says. “The government should stop political gimmicks such as one kg rice for Rs.2 schemes. Subsidies should go to the farmers, not consumers,” he says. Instead of the existing sops, farmers should be offered subsidies for increasing the paddy area and production, says P Vikraman, former agriculture officer in Wayanad district. Since the state’s paddy cultivation area is just about 200,000 ha, the government can provide 100 per cent subsidy for growing rice or, at least, half of the labour cost should be subsidised. This can be done easily by converging MGNREGA with paddy cultivation. “Farmers will be happy to bear half the labour cost,” says Sreeja K V, organic farmer in Thrissur. Considering food security and environmental benefits of paddy cultivation, the government should give subsidy to farmers with land up to 5 ha, says Arun. Kerala has efficient local bodies, a large network of cooperative credit societies, cooperative agricultural banks and paddy cluster committees. “If these institutions join hands, they can make a big difference,” say K N Harilal, fellow, the Centre for Development Studies, Thiruvananthapuram, who has done extensive studies on the rice sector in the state. He has a point there. Wadakkanchery block panchayat in Thrissur district has set an example by forming the Green Army to address the problem of labour scarcity. Additional methods of non-farm income can be generated by developing rice bio-parks where value-added products can be prepared from rice grain, straw, bran and husk. Special rice varieties such as Njavara rice, which is used for medicinal purposes, should be promoted, he adds. The state’s Draft Agriculture Development Policy 2013 incorporates these suggestions. It seeks to enhance area, production and productivity of paddy apart from ensuring financial and social security to farmers and farm labourers. The draft stresses on giving maximum protection to paddy fields by declaring them as reserved zones. If cleared by the state, it may give paddy and its growers a new lease of life.